Family time has never been this fun or life-changing. Say good-bye to passive family devotions. 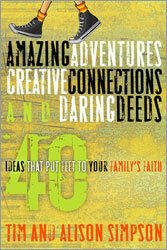 Parents will welcome the energy and creativity of these forty activities, which can be adapted for all ages. Instead of reading and reflecting on a verse that is quickly forgotten, families will engage in activities both inside and outside the home that demonstrate biblical faith in action. The result: parents and kids living as disciples, whatever their spheres of influence. Includes age-appropriate discussion questions and activities for ages four through fourteen.